USB Dongle – Fashion Accessory? You know USB dongles have become mainstream when operators start selling different color skins to go with them. H3G in Sweden (also called Tre) is positioning their mobile broadband as the “most stylish broadband” in addition to being the fastest! 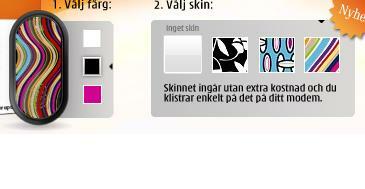 “Sign up for 3 mobile broadband for 18 months and receive any skin at no extra cost” according to their offer at 3’s website. What will they think of next? Pingback: Fashion News » Blog Archive » USB Dongle - Fashion Accessory? Yes, I noticed this a while back – it’s been going on in the UK since at least the beginning of this year. With some of the prices I’m seeing at the moment, the profit margin on a £5 skin is probably more than on 6 months of HSDPA access….